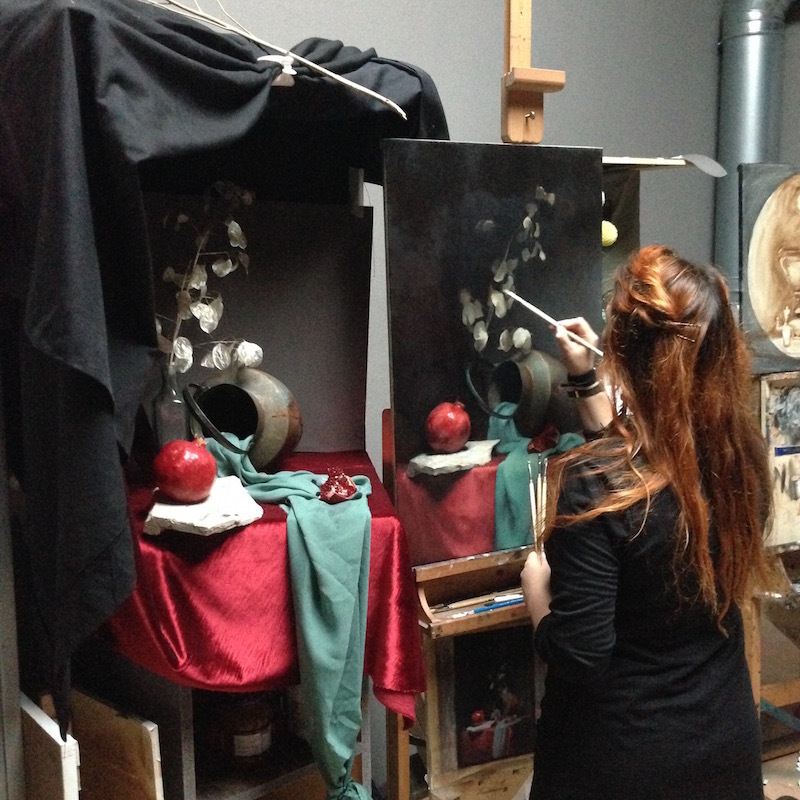 Through intense observation, students develop their ability to reproduce an accurate visual impression of the model. The instructor will lead them through a step-by-step process of drawing the head, acheiving accurate proportions, modeling light and form, and mixing accurate skin colors. This workshop, led by professional artist, Toby Wright, with years of experience in teaching classical methods, is intended for those with a passion for realistic painting a strong desire to develop their artistic skills. Most of the instruction is on an individual basis and Toby will adapt the exercises to your level of experience, which means that the course is suitable for both beginners and professional artists. In addition to the individual feedback group lessons will be held. The skills you acquire during your course can be applied directly to your continued artistic endeavors. Full payment for each course is required to secure your spot in the Spring Workshop Sessions 2019. Until payment is received spots can be given away to others who pay the course fees. If you withdraw from the course 30 days or more before the first day of class you will receive a 75% refund. If you withdraw seven days or more before the first day of class you will receive a 50% refund. If you withdraw less than seven days before the first day of class then you will not receive any refund. The Florence Academy of Art reserves the right to substitute instructors of any course at the last minute or during the session. Daily instruction in the English language. All material necessary to complete the course. 3 + 3 h/day with the model (where applicable). Museum entrance ticket (where applicable). Instruction in the English language for all classes and group lessons. The kitchen area of the school is available to students throughout the duration of the course. The Florence Academy of Art will provide a list of available housing in the vicinity to accepted students. The administrative staff is available before the course, as well as during the course, to assist students and answer questions. Booking and organizing housing is the responsibility of the student. Costs for housing and accomodation are not included in the course fee. The student is responsible for organization and costs related to transport to and from Mölndal. After the course is completed, the student will have the opportunity to receive assistance with shipping work completed during the course. An additional fee will be charged for this optional service. Specific rules apply for sculpture courses. Please send an email to info@florenceacademyofart.se for details. Graduate of The Florence Academy of Art, Toby Wright was invited to assist teaching while continuing his studies. His positions included director of the drawing program for the sculpture department, and principal instructor in the advanced painting program. Inspired by various old masters of painting and sculpture from the 17th and 19th century, Toby Wright believes in the method of working from life to capture the full depth of his subjects. His work can be found in galleries and private collections in Europe and America. He currently paints in his studio, in Monaco. The Florence Academy of Art endeavors to provide an educational environment conducive to encouraging the artistic talents of each student. This requires that all students respect the policies of the Academy, its instructors, and the other students in the program. By enrolling in the Academy, students agree to subscribe to these policies as contained in the Student Handbook available on this website. Minimum enrollment requirement for all courses is 5. Students will be notified if this number is not reached 60 days before the first day of class. At that time, they will be given the choice of either enrolling in another class, availability permitting, or having a full refund of the course fee. Full payment for each course is required to secure your spot in the Spring Workshop Sessions 2018. Until payment is received spots can be given away to others who pay the course fees. If you withdraw from the course 30 days or more before the first day of class you will receive a 75% refund. If you withdraw seven days or more before the first day of class you will receive a 50% refund. If you withdraw less than seven days before the first day of class then you will not receive any refund. *The Florence Academy of Art reserves the right to substitute instructors of any course at the last minute or during the session. The Florence Academy of Art is a United States non-profit 501 c (3) educational entity, and admits students of any race, age, color and national or ethnic origin. 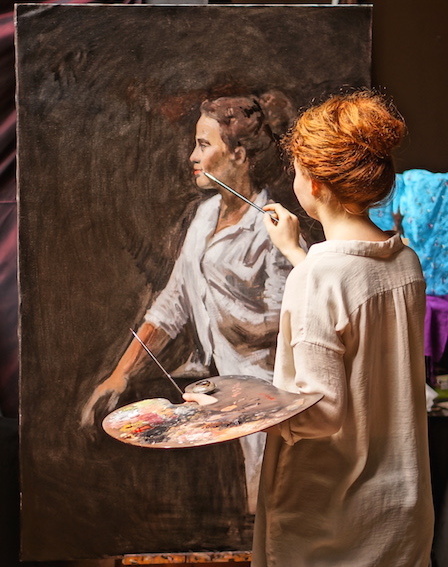 During this workshop students will have the chance to paint colorful fabric, still life objects, and human skin while working from a live model. We will have the same set up for both weeks so applicants who sign up for both will have additional time to work on their painting. This workshop, led by professional artist, Tanvi Pathare, with years of experience in teaching classical methods, is intended for those with a passion for realistic painting a strong desire to develop their artistic skills. Most of the instruction is on an individual basis and Tanvi will adapt the exercises to your level of experience, which means that the course is suitable for both beginners and professional artists. In addition to the individual feedback, group lessons will be held. The skills you acquire during your course can be applied directly to your continued artistic endeavors. Tanvi Pathare born in Mumbai, India, showed a growing interest in the fine arts since a very early age. She graduated with honors from the prestigious Sir J. J. School of Art in Mumbai where she received a Bachelors of Fine Arts in Painting. Following the allure of the realistic tradition of painting from nature, Tanvi attended The Florence Academy of Art, Florence, Italy, graduating from the Painting Program in 2012. During her second year, she won the award for Best Figure Painting in the Intermediate Program, and in her final year, she was awarded Honorable Mention for Exceptional Overall Performance in Advanced Painting. She is recipient of the prestigious Elizabeth Greenshields Foundation Grant for Painting (2012), and a finalist in the Figurative Category of the ARC International Salon 2012-2013. Tanvi began teaching at The Florence Academy of Art as a student, and is presently a principal instructor in the Intensive Drawing and Painting programs at The Florence Academy of Art. She works privately in Florence. In this course students learn techniques to sculpt a portrait (head). 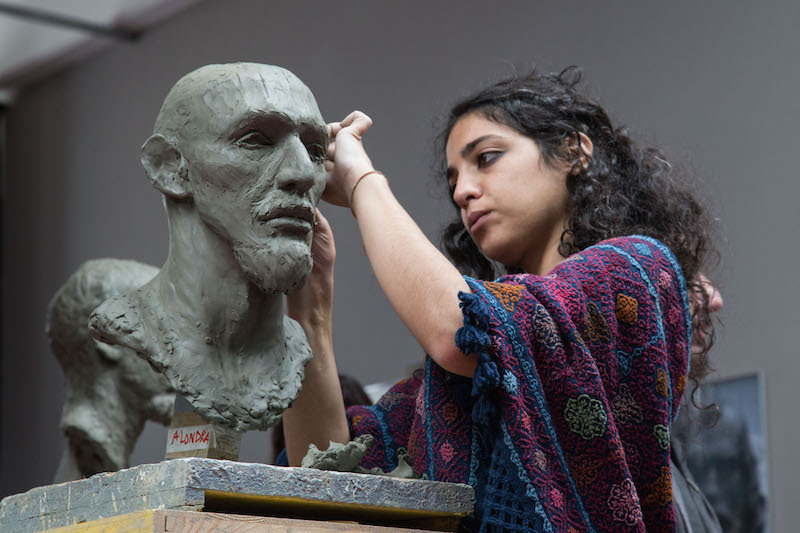 With a focus on improving understanding of the structure of the human head and its anatomy, the instructor will introduce relevant ways to measure and sculpt individual traits and expression through the study of symmetry and asymmetry. This workshop, led by professional artist, Thor Larsen, with years of experience in teaching classical methods, is intended for those students with a passion for realistic sculpture and a strong desire to develop their artistic skills. Most of the instruction is on an individual basis and Thor will adapt the exercises to your level of experience, which means that the courses are suitable for both beginners and professional artists. In addition to the individual feedback group lessons will be held. The skills you acquire during your course can be applied directly to your continued artistic endeavors. Thor Larsen is a sculptor from Copenhagen, Denmark. He recieved his education at the renowned Rudolf Steiner School (1992-2004). After graduating from there, and following his passion for art, Larsen enrolled in the basic course for training to be a goldsmith at KTS. (2004-2005), and later attended EUC to become a stone mason (2005-2009). He graduated with a bronze medal. The search for academic sculpture brought Larsen to Florence, Italy, where he attended The Florence Academy of Art, graduating from the Sculpture Program in 2013. Larsen currently works from his private studio in Florence and is a Principal Instructor in the Sculpture Program . See more of Thor’s work at www.thorlarsen.net. In this course the focus will be on the interplay between light and dark, atmospheric perspective, and composition. The instructor will lead the group to places in and around the historic mill town of Kvarnbyn with it’s old factories, waterfall, and nearby lakes and apple orchards. This workshop, led by professional artist, Zacheriah Kramer, with years of experience in teaching classical methods, is intended for those with a passion for realistic painting and a strong desire to develop their artistic skills. Most of the instruction is on an individual basis and Zach will adapt the exercises to your level of experience, which means that the courses are suitable for both beginners and professional artists. The skills you acquire during your course can be applied directly to your continued artistic endeavors. Zacheriah Kramer was born in 1979 in Greeley, Colorado, and raised on the plains of northeastern Colorado. He received his education in art at The Florence Academy of Art in both Gothenburg, Sweden, and Florence, Italy. He was made an assistant instructor in classical drawing at the FAA in 2010 while he was still a student, and continues to teach for the academy. Zacheriah was awarded the academy’s 20th Anniversary 4th Year Prize, and spent the 2011-2012 academic year in Florence, under the mentorship of Daniel Graves. He was a visiting instructor at the 2013 Alpine Fellowship in Switzerland. Zacheriah has a broad interest in the arts and humanities, and has formally studied philosophy, theology, and language. He remains an eager student of the ideas that have shaped western culture. Zacheriah resides in Ydre, Sweden, with his wife Kristin.